A young food blogger shares her inspiring story of incredible weight loss--a journey from nearly 300 pounds to losing more than half her size--and establishing a healthy and confident relationship with food. On her twentieth birthday, Andie Mitchell stepped on the scale and discovered that she weighed nearly 300 pounds. At 5' 9"--even knowing that she was big and hating herself for it--she was stunned. How had she gotten there? Without following wild diet trends, she lost 135 pounds over thirteen months and has kept it off for six years. 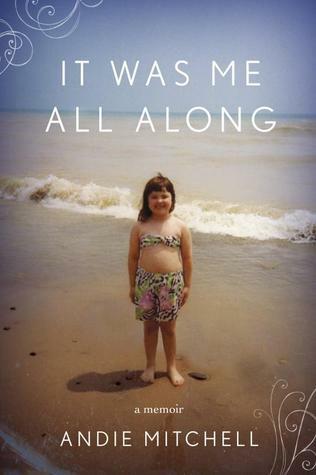 It Was Me All Along shares the at times heartbreaking, yet ultimately uplifting and motivating, story of how Andie kicked her habit of binge eating, which she developed during a traumatic childhood, and developed a healthy relationship with food, which she still loves to cook and enjoy. Her story is at once familiar and inspiring to millions who have struggled with weight and self-image issues. Andie is a powerful motivator who bravely bares all to help others. When I chose this book, I had no idea if I'd like it or not. Honestly, I get a little touchy about bloggers who have made it big. I haven't the slightest idea why. Perhaps I ought to look into that at some point. For now though, let me tell you about this book and the impact that it had on me. Andie Mitchell and I could be food issue twins. As I was reading, it was as if I had sat down and just started writing. The difference is that she's already lost the weight and I'm still at that I eat to feel full..emotionally full...and finding ways to come to terms with my past so that I can move on to the future. Honestly, this whole review could turn into a post about my own relationship with food and the people in my world, but I don't want that (stay tuned though, that post is most likely coming). What I want to say is that Andie writes like a real person. She's honest about the good, the bad, and the ugly. She doesn't pull punches or spend an entire book making excuses or feeling sorry for herself. She's real and that clicked with me. There aren't enough words in my vocabulary to tell you just how much I think you should read this book, especially if you've ever (or currently) have food issues, eating disorders, or are struggling. Andie, in her realness, gives her readers another kernel of hope and sometimes there is nothing more valuable.